Do you wish that your teeth were just a little bit whiter, or that you could eliminate those obvious gaps? Perhaps you want a complete smile makeover so your teeth can stop getting in the way of you living your life. No matter the case, Eco Dental can do it all. Dr. Danny Nguyen, Dr. Cindy Hua, and our team can give patients the smiles of their dreams with just one or two simple treatments. Afterward, you’ll wish that you had come to see us sooner! Read below to learn about everything we can do to make your smile truly shine. They are extremely thin porcelain coverings that are bonded to the front of the teeth, and they can improve your smile’s appearance in almost every way. Every set we make is custom-designed, so they can give you everything from a slight boost to a dramatic transformation. It’s all up to you, and it’s all possible. If one of your front teeth becomes damaged, we understand that this requires special care. We won’t simply use a silver or metal crown to fix it because we understand how important your appearance is to your daily life. When you need the best of both restorative and cosmetic dentistry, we’ll only use metal-free restorations. These crowns, inlays, and onlays (partial crowns) are made completely from dental porcelain. This will enable them to provide you the perfect aesthetic solution while giving you the security you need. 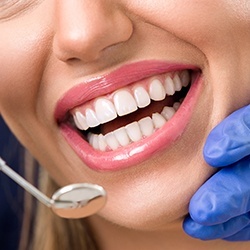 Dental porcelain can be specially designed so that it perfectly matches the natural color of your teeth, and it is strong enough that you’ll be able to bite into an apple without worry. These materials are also very environmentally friendly, which helps us in our mission to reduce our practice’s carbon footprint. In the end, these restorations will give you a tooth that is beautiful, reliable, and you’ll be eager to show off your smile once again. For small chips and cracks, we have a very quick and easy treatment to help you get out of our office as fast as possible with a beautiful result. It’s called direct bonding, and it allows our doctors to sculpt away any small imperfections in your smile. They’ll apply a putty-like composite resin to your teeth, mold it to your liking, and then harden it with a curing light. Before you know it, you’re done, and your new smile is ready for the world. 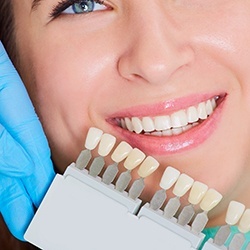 If your teeth are looking yellow and stained, then the quickest way to make them shine again is to come to Eco Dental for a complete teeth whitening treatment. Using Kor Whitening, we’ll be able to eliminate years of stains in just an hour, and you’ll be amazed at the kind of results we can achieve in such a short amount of time. It’s the perfect treatment for the person on the go who always wants to look their best. Of course, if you’d like to whiten your smile more gradually, we can help with that as well. We can provide you with a Kor Whitening take-home kit. Kor Whitening is special because, unlike any other whitening method, it is able to eliminate both extrinsic (located on the outside of your teeth) and intrinsic (located deep in your enamel) stains. This means you’ll get a much deeper whitening, which will give you a much more reliable and long lasting result you simply can’t find on store shelves. Sometimes, beautiful teeth can be hidden by an excess of gum tissue, causing them to look short and stubby. To fix this problem, we can use a simple procedure called gum recontouring/crown lengthening. We’ll gently remove extra gum tissue using a safe and effective soft tissue laser to reveal more of your natural teeth. It’s a great way to help you achieve that perfectly proportioned and balanced smile. Yes, you can get Botox from your dentist! 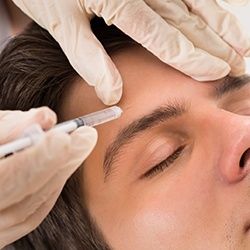 Our entire team has been extensively trained on the anatomy of the face, so we’ll know exactly how to apply the Botox to give you the best possible results. This treatment has been used for years to safely and easily eliminate facial wrinkles to help people turn back the clock. The treatment only takes about 10 minutes to complete, and the results can easily last for several months. 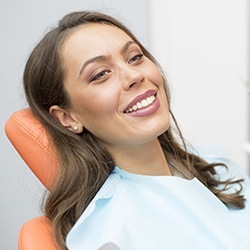 If any of these treatments sound just like what your smile needs, then be sure to contact our Sugar Land location today. 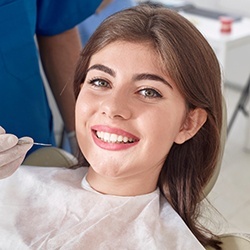 Even if you’re not sure which treatments would be right for you, our team can walk you through each procedure to let you know which ones will help you achieve your personal smile goals. If you’re interested in straightening your smile but you don’t want to worry about the hassles of brackets, wires, and frequent orthodontist appointments, it’s time to schedule an Invisalign orthodontics consultation at Eco Dental. Unlike traditional bracket and wire braces that take years to complete, noticeably mar your smile, and leave you with achy teeth and irritated soft tissue, Invisalign offers quick, cosmetic, comfortable smile alignment. The treatment process is simple. You’ll receive a series of alignment trays. 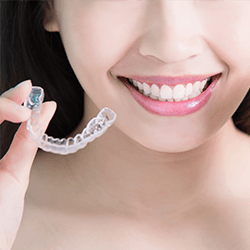 Each set of aligners represents your smile one step closer to the ideal end result. You’ll wear the set of trays for about two weeks. Then, simply remove the aligners and exchange them for the next set in the series. You’ll have to come in for checkups every six to eight weeks, so we can ensure your smile is shifting according to plan. In just ten to eighteen months, you’ll have a beautiful smile. Because your aligners are removable, you don’t need to worry about changing your diet or oral hygiene routine throughout treatment.